installed some themes everything working well then Window decorations started to fail. for example i installed https://www.opendesktop.org/p/1270113/ it worked well for some days then it suddenly failed! What do you mean by "start to fail"? Do they disappear? When it happens, is the xfwm4 process still working? At what is logged in ~/.xsession-errors? Here's a thread with a similar problem, turned out to be some trouble with the window manager (xfwm4) and/or the session saving. On preview: follow ToZ's advice, he's reeeeally good at this! xfwm4-Message: 10:18:01.016: To replace the current window manager, try "--replace"
thank you! that thread didnt help..
(xfce4-session:1627): xfce4-session-WARNING **: 10:12:48.345: xfsm_manager_load_session: Something wrong with /home/lapp/.cache/sessions/xfce4-session-lapp-EASYNOTE-MX52-B-702NCD:0, Does it exist? Permissions issue? (xfsettingsd:1659): xfsettingsd-WARNING **: 10:12:49.888: Failed to get the _NET_NUMBER_OF_DESKTOPS property. (wrapper-2.0:1802): Gtk-WARNING **: 10:12:51.784: Attempting to add a widget with type GtkToggleButton to a container of type XfcePanelPlugin, but the widget is already inside a container of type XfcePanelPlugin, please remove the widget from its existing container first. ** (wrapper-2.0:1806): WARNING **: 10:12:52.027: Binding 'XF86AudioLowerVolume' failed! (wrapper-2.0:1806): pulseaudio-plugin-WARNING **: 10:12:52.027: Could not have grabbed volume control keys. Is another volume control application (xfce4-volumed) running? restack_win(0x008002e0, 0x0260001b): Failed to found new above window. glx_bind_pixmap(0x02e04398): Failed to query Pixmap info. win_paint_win(0x01000015): Failed to bind texture. Expect troubles. win_paint_win(0x01000015): Missing painting data. This is a bad sign. shall i post pictures on problem? Yes please. Also, can you post the last 50 lines of so of ~/.xsession-errors when the issue happens. There was nothing is the last logs that indicated a problem with xfwm4. And finally, can you please use code blocks when posting outputs? It makes it much easier to read. I'll edit your post above to include them. i also discovered that many window borders are missing! /home/lapp/.themes/Ultimate-Maia/gtk-2.0/main.rc:904: Unable to locate image file in pixmap_path: "assets/tab.png"
/home/lapp/.themes/Ultimate-Maia/gtk-2.0/main.rc:920: Unable to locate image file in pixmap_path: "assets/tab.png"
/home/lapp/.themes/Ultimate-Maia/gtk-2.0/main.rc:936: Unable to locate image file in pixmap_path: "assets/tab.png"
/home/lapp/.themes/Ultimate-Maia/gtk-2.0/main.rc:952: Unable to locate image file in pixmap_path: "assets/frame-notebook.png"
/home/lapp/.themes/Ultimate-Maia/gtk-2.0/main.rc:955: Unable to locate image file in pixmap_path: "assets/tab.png"
/home/lapp/.themes/Ultimate-Maia/gtk-2.0/main.rc:963: Unable to locate image file in pixmap_path: "assets/frame-notebook.png"
/home/lapp/.themes/Ultimate-Maia/gtk-2.0/main.rc:966: Unable to locate image file in pixmap_path: "assets/tab.png"
/home/lapp/.themes/Ultimate-Maia/gtk-2.0/main.rc:974: Unable to locate image file in pixmap_path: "assets/frame-notebook.png"
/home/lapp/.themes/Ultimate-Maia/gtk-2.0/main.rc:977: Unable to locate image file in pixmap_path: "assets/tab.png"
/home/lapp/.themes/Ultimate-Maia/gtk-2.0/main.rc:985: Unable to locate image file in pixmap_path: "assets/frame-notebook.png"
/home/lapp/.themes/Ultimate-Maia/gtk-2.0/main.rc:988: Unable to locate image file in pixmap_path: "assets/tab.png"
/home/lapp/.themes/Ultimate-Maia/gtk-2.0/main.rc:997: Unable to locate image file in pixmap_path: "assets/frame-notebook.png"
/home/lapp/.themes/Ultimate-Maia/gtk-2.0/main.rc:1009: Unable to locate image file in pixmap_path: "assets/scrollbar-horz-trough.png"
/home/lapp/.themes/Ultimate-Maia/gtk-2.0/main.rc:1091: Unable to locate image file in pixmap_path: "assets/scrollbar-vert-ltr-slider-hover.png"
/home/lapp/.themes/Ultimate-Maia/gtk-2.0/main.rc:1102: Unable to locate image file in pixmap_path: "assets/scrollbar-vert-ltr-slider-active.png"
/home/lapp/.themes/Ultimate-Maia/gtk-2.0/main.rc:1148: Unable to locate image file in pixmap_path: "assets/scrollbar-vert-rtl-slider-active.png"
/home/lapp/.themes/Ultimate-Maia/gtk-2.0/main.rc:1195: Unable to locate image file in pixmap_path: "assets/scale-horz-trough-active.png"
/home/lapp/.themes/Ultimate-Maia/gtk-2.0/main.rc:1391: Unable to locate image file in pixmap_path: "assets/entry-background-insensitive.png"
/home/lapp/.themes/Ultimate-Maia/gtk-2.0/main.rc:1413: Unable to locate image file in pixmap_path: "assets/pan-up-alt.png"
/home/lapp/.themes/Ultimate-Maia/gtk-2.0/main.rc:1422: Unable to locate image file in pixmap_path: "assets/spin-ltr-up-hover.png"
/home/lapp/.themes/Ultimate-Maia/gtk-2.0/main.rc:1425: Unable to locate image file in pixmap_path: "assets/pan-up.png"
/home/lapp/.themes/Ultimate-Maia/gtk-2.0/main.rc:1434: Unable to locate image file in pixmap_path: "assets/spin-ltr-up-active.png"
/home/lapp/.themes/Ultimate-Maia/gtk-2.0/main.rc:1437: Unable to locate image file in pixmap_path: "assets/pan-up.png"
/home/lapp/.themes/Ultimate-Maia/gtk-2.0/main.rc:1460: Unable to locate image file in pixmap_path: "assets/spin-rtl-up.png"
/home/lapp/.themes/Ultimate-Maia/gtk-2.0/main.rc:1463: Unable to locate image file in pixmap_path: "assets/pan-up-alt.png"
/home/lapp/.themes/Ultimate-Maia/gtk-2.0/main.rc:1475: Unable to locate image file in pixmap_path: "assets/pan-up.png"
/home/lapp/.themes/Ultimate-Maia/gtk-2.0/main.rc:1487: Unable to locate image file in pixmap_path: "assets/pan-up.png"
/home/lapp/.themes/Ultimate-Maia/gtk-2.0/main.rc:1513: Unable to locate image file in pixmap_path: "assets/pan-down-alt.png"
/home/lapp/.themes/Ultimate-Maia/gtk-2.0/main.rc:1549: Unable to locate image file in pixmap_path: "assets/pan-down-alt-insensitive.png"
/home/lapp/.themes/Ultimate-Maia/gtk-2.0/main.rc:1563: Unable to locate image file in pixmap_path: "assets/pan-down-alt.png"
/home/lapp/.themes/Ultimate-Maia/gtk-2.0/main.rc:1572: Unable to locate image file in pixmap_path: "assets/spin-rtl-down-hover.png"
/home/lapp/.themes/Ultimate-Maia/gtk-2.0/main.rc:1599: Unable to locate image file in pixmap_path: "assets/pan-down-alt-insensitive.png"
/home/lapp/.themes/Ultimate-Maia/gtk-2.0/main.rc:1733: Unable to locate image file in pixmap_path: "assets/menu-checkbox-unchecked-insensitive.png"
/home/lapp/.themes/Ultimate-Maia/gtk-2.0/main.rc:1797: Unable to locate image file in pixmap_path: "assets/menu-checkbox-mixed-insensitive.png"
/home/lapp/.themes/Ultimate-Maia/gtk-2.0/main.rc:2031: Unable to locate image file in pixmap_path: "assets/combo-ltr-entry.png"
/home/lapp/.themes/Ultimate-Maia/gtk-2.0/main.rc:2085: Unable to locate image file in pixmap_path: "assets/combo-rtl-entry-insensitive.png"
/home/lapp/.themes/Ultimate-Maia/gtk-2.0/main.rc:2099: Unable to locate image file in pixmap_path: "assets/combo-ltr-button.png"
/home/lapp/.themes/Ultimate-Maia/gtk-2.0/main.rc:2109: Unable to locate image file in pixmap_path: "assets/combo-ltr-button-hover.png"
/home/lapp/.themes/Ultimate-Maia/gtk-2.0/main.rc:2119: Unable to locate image file in pixmap_path: "assets/combo-ltr-button-active.png"
/home/lapp/.themes/Ultimate-Maia/gtk-2.0/main.rc:2153: Unable to locate image file in pixmap_path: "assets/combo-rtl-button-hover.png"
/home/lapp/.themes/Ultimate-Maia/gtk-2.0/main.rc:2173: Unable to locate image file in pixmap_path: "assets/combo-rtl-button-insensitive.png"
/home/lapp/.themes/Ultimate-Maia/gtk-2.0/main.rc:2233: Unable to locate image file in pixmap_path: "assets/notebook-entry.png"
/home/lapp/.themes/Ultimate-Maia/gtk-2.0/main.rc:2287: Unable to locate image file in pixmap_path: "assets/notebook-combo-ltr-entry.png"
/home/lapp/.themes/Ultimate-Maia/gtk-2.0/main.rc:2307: Unable to locate image file in pixmap_path: "assets/notebook-combo-ltr-entry-insensitive.png"
/home/lapp/.themes/Ultimate-Maia/gtk-2.0/main.rc:2331: Unable to locate image file in pixmap_path: "assets/notebook-combo-rtl-entry-active.png"
/home/lapp/.themes/Ultimate-Maia/gtk-2.0/main.rc:2341: Unable to locate image file in pixmap_path: "assets/notebook-combo-rtl-entry-insensitive.png"
/home/lapp/.themes/Ultimate-Maia/gtk-2.0/main.rc:2366: Unable to locate image file in pixmap_path: "assets/scale-horz-trough-active.png"
/home/lapp/.themes/Ultimate-Maia/gtk-2.0/main.rc:2435: Unable to locate image file in pixmap_path: "assets/treeview-ltr-button.png"
/home/lapp/.themes/Ultimate-Maia/gtk-2.0/main.rc:2453: Unable to locate image file in pixmap_path: "assets/treeview-ltr-button-active.png"
/home/lapp/.themes/Ultimate-Maia/gtk-2.0/main.rc:2480: Unable to locate image file in pixmap_path: "assets/treeview-rtl-button-active.png"
/home/lapp/.themes/Ultimate-Maia/gtk-2.0/main.rc:2489: Unable to locate image file in pixmap_path: "assets/pan-up-alt.png"
/home/lapp/.themes/Ultimate-Maia/gtk-2.0/main.rc:2497: Unable to locate image file in pixmap_path: "assets/pan-up.png"
/home/lapp/.themes/Ultimate-Maia/gtk-2.0/main.rc:2505: Unable to locate image file in pixmap_path: "assets/pan-up.png"
/home/lapp/.themes/Ultimate-Maia/gtk-2.0/main.rc:2513: Unable to locate image file in pixmap_path: "assets/pan-down-alt.png"
/home/lapp/.themes/Ultimate-Maia/gtk-2.0/main.rc:2540: Unable to locate image file in pixmap_path: "assets/frame.png"
/home/lapp/.themes/Ultimate-Maia/gtk-2.0/main.rc:2556: Unable to locate image file in pixmap_path: "assets/frame.png"
/home/lapp/.themes/Ultimate-Maia/gtk-2.0/main.rc:2563: Unable to locate image file in pixmap_path: "assets/frame.png"
/home/lapp/.themes/Ultimate-Maia/gtk-2.0/main.rc:2599: Unable to locate image file in pixmap_path: "assets/flat-button-active.png"
/home/lapp/.themes/Ultimate-Maia/gtk-2.0/main.rc:2607: Unable to locate image file in pixmap_path: "assets/flat-button-active.png"
/home/lapp/.themes/Ultimate-Maia/gtk-2.0/apps.rc:17: Unable to locate image file in pixmap_path: "assets/pan-up-alt.png"
/home/lapp/.themes/Ultimate-Maia/gtk-2.0/apps.rc:25: Unable to locate image file in pixmap_path: "assets/pan-up.png"
/home/lapp/.themes/Ultimate-Maia/gtk-2.0/apps.rc:33: Unable to locate image file in pixmap_path: "assets/pan-up.png"
/home/lapp/.themes/Ultimate-Maia/gtk-2.0/apps.rc:49: Unable to locate image file in pixmap_path: "assets/pan-down-alt.png"
/home/lapp/.themes/Ultimate-Maia/gtk-2.0/apps.rc:73: Unable to locate image file in pixmap_path: "assets/pan-down-alt-insensitive.png"
thunar-volman: Unsupported input device type "/dev/input/event10". thunar-volman: Unsupported input device type "(null)". (wrapper-2.0:5428): Gtk-WARNING **: 13:06:06.130: Attempting to add a widget with type GtkToggleButton to a container of type XfcePanelPlugin, but the widget is already inside a container of type XfcePanelPlugin, please remove the widget from its existing container first. thunar-volman: Unsupported USB device type "uvcvideo". ** (wrapper-2.0:5437): WARNING **: 13:06:06.286: Binding 'XF86AudioLowerVolume' failed! (wrapper-2.0:5437): pulseaudio-plugin-WARNING **: 13:06:06.286: Could not have grabbed volume control keys. Is another volume control application (xfce4-volumed) running? /home/lapp/.themes/Ultimate-Maia/gtk-2.0/main.rc:149: Unable to locate image file in pixmap_path: "assets/checkbox-unchecked.png"
/home/lapp/.themes/Ultimate-Maia/gtk-2.0/main.rc:165: Unable to locate image file in pixmap_path: "assets/checkbox-unchecked-active.png"
/home/lapp/.themes/Ultimate-Maia/gtk-2.0/main.rc:173: Unable to locate image file in pixmap_path: "assets/checkbox-unchecked.png"
/home/lapp/.themes/Ultimate-Maia/gtk-2.0/main.rc:181: Unable to locate image file in pixmap_path: "assets/checkbox-unchecked-insensitive.png"
/home/lapp/.themes/Ultimate-Maia/gtk-2.0/main.rc:261: Unable to locate image file in pixmap_path: "assets/checkbox-mixed-insensitive.png"
/home/lapp/.themes/Ultimate-Maia/gtk-2.0/main.rc:273: Unable to locate image file in pixmap_path: "assets/radio-unchecked.png"
/home/lapp/.themes/Ultimate-Maia/gtk-2.0/main.rc:281: Unable to locate image file in pixmap_path: "assets/radio-unchecked-hover.png"
/home/lapp/.themes/Ultimate-Maia/gtk-2.0/main.rc:289: Unable to locate image file in pixmap_path: "assets/radio-unchecked-active.png"
/home/lapp/.themes/Ultimate-Maia/gtk-2.0/main.rc:297: Unable to locate image file in pixmap_path: "assets/radio-unchecked.png"
/home/lapp/.themes/Ultimate-Maia/gtk-2.0/main.rc:305: Unable to locate image file in pixmap_path: "assets/radio-unchecked-insensitive.png"
/home/lapp/.themes/Ultimate-Maia/gtk-2.0/main.rc:313: Unable to locate image file in pixmap_path: "assets/radio-checked.png"
/home/lapp/.themes/Ultimate-Maia/gtk-2.0/main.rc:321: Unable to locate image file in pixmap_path: "assets/radio-checked-hover.png"
/home/lapp/.themes/Ultimate-Maia/gtk-2.0/main.rc:337: Unable to locate image file in pixmap_path: "assets/radio-checked.png"
/home/lapp/.themes/Ultimate-Maia/gtk-2.0/main.rc:385: Unable to locate image file in pixmap_path: "assets/radio-mixed-insensitive.png"
/home/lapp/.themes/Ultimate-Maia/gtk-2.0/main.rc:480: Unable to locate image file in pixmap_path: "assets/pan-up.png"
/home/lapp/.themes/Ultimate-Maia/gtk-2.0/main.rc:504: Unable to locate image file in pixmap_path: "assets/pan-up-alt.png"
/home/lapp/.themes/Ultimate-Maia/gtk-2.0/main.rc:512: Unable to locate image file in pixmap_path: "assets/pan-up.png"
/home/lapp/.themes/Ultimate-Maia/gtk-2.0/main.rc:520: Unable to locate image file in pixmap_path: "assets/pan-up.png"
/home/lapp/.themes/Ultimate-Maia/gtk-2.0/main.rc:536: Unable to locate image file in pixmap_path: "assets/pan-down-alt.png"
/home/lapp/.themes/Ultimate-Maia/gtk-2.0/main.rc:560: Unable to locate image file in pixmap_path: "assets/pan-down-alt-insensitive.png"
/home/lapp/.themes/Ultimate-Maia/gtk-2.0/main.rc:600: Unable to locate image file in pixmap_path: "assets/pan-right-alt.png"
/home/lapp/.themes/Ultimate-Maia/gtk-2.0/main.rc:624: Unable to locate image file in pixmap_path: "assets/pan-right-alt-insensitive.png"
/home/lapp/.themes/Ultimate-Maia/gtk-2.0/main.rc:636: Unable to locate image file in pixmap_path: "assets/pan-down-alt.png"
/home/lapp/.themes/Ultimate-Maia/gtk-2.0/main.rc:657: Unable to locate image file in pixmap_path: "assets/pan-down-alt-insensitive.png"
/home/lapp/.themes/Ultimate-Maia/gtk-2.0/main.rc:702: Unable to locate image file in pixmap_path: "assets/handle-horz-active.png"
/home/lapp/.themes/Ultimate-Maia/gtk-2.0/main.rc:718: Unable to locate image file in pixmap_path: "assets/handle-horz-active.png"
/home/lapp/.themes/Ultimate-Maia/gtk-2.0/main.rc:734: Unable to locate image file in pixmap_path: "assets/handle-vert-hover.png"
/home/lapp/.themes/Ultimate-Maia/gtk-2.0/main.rc:742: Unable to locate image file in pixmap_path: "assets/handle-vert-active.png"
/home/lapp/.themes/Ultimate-Maia/gtk-2.0/main.rc:759: Unable to locate image file in pixmap_path: "assets/pan-down-alt.png"
/home/lapp/.themes/Ultimate-Maia/gtk-2.0/main.rc:780: Unable to locate image file in pixmap_path: "assets/pan-down-alt-insensitive.png"
/home/lapp/.themes/Ultimate-Maia/gtk-2.0/main.rc:789: Unable to locate image file in pixmap_path: "assets/pan-right-alt.png"
/home/lapp/.themes/Ultimate-Maia/gtk-2.0/main.rc:813: Unable to locate image file in pixmap_path: "assets/pan-right-alt-insensitive.png"
/home/lapp/.themes/Ultimate-Maia/gtk-2.0/main.rc:888: Unable to locate image file in pixmap_path: "assets/tab.png"
Any chance that the OP's xfwm4(?) 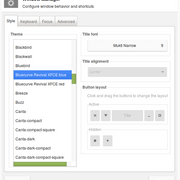 has been compiled to use only GTK3 themes (if such a thing is even possible)? I notice a lot of those errors reference themes in a gtk-2.0 directory tree. 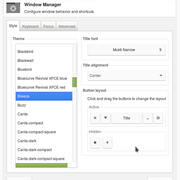 The error messages are related to the Appearance theme, not the window manager theme. ...to see if it brings them back. The second one is odd. Are you running compiz? What video card and driver are you using? Can you create a second test account on your computer and see if you can replicate the problem there? command did nothing, running xfwm4+compositing, have tried all but compiz. couldnt in second account replicate, the second account had same problems. peer81, probably shooting blanks here, but where do you have that "Bluecurve Revival XFCE blue" theme located exactly? Can you write the whole path? Maybe the theme's "xfwm4" folder is inside some another folder (e.g. ~/.themes/Bluecurve-Revival-XFCE-blue/Bluecurve/xfwm4/) and that causes the issue. And what are the permissions on that theme's folders and files? Maybe it's root only?